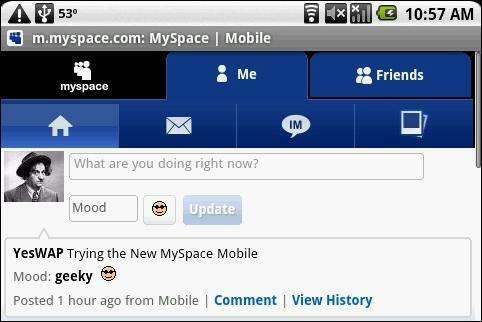 The major new feature of the middle web version of MySpace is the inclusion of a web based version of the MYSpace IM client. 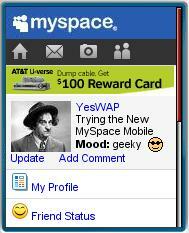 Otherwise it duplicates the functionality of MySpace’s regular mobile site (image left) which includes the ability to send and read messages and comments, update your mood and status, browse photo albums and profiles, view videos that you have added to your profile, add friends and read and post to blogs. The new MySpace middle web site is a nice upgrade for users of one of the supported devices, especially if they are active on MySpace and use the IM feature. I’m a little disappointed that the new mobile version doesn’t exploit MySpace’s collection of over 20,000 music videos and thousands of .MP3 audio files on band pages. There is no way to search or browse video or audio with MySpace mobile and you can’t even see the videos amd music on friend’s profiles. To watch MySpace videos on the mobile site you have to first use the full web version of MySpace to add each video you like to watch to your profile. That’s really cumbersome. It doesn’t seem to be possible access audio in MySpace Mobile at all. I don’t understand why MySpace hasn’t done more with video and audio on mobile. I’m sure MySpace users would love to search, browse and share videos and music and view the ones on other users profiles using the mobile interface like they can on the full web one. Source: ReadWriteWeb. This entry was posted in Mobile Social and tagged middle web, mobile site review, myspace by Dennis Bournique. Bookmark the permalink.